Madia Hendricks fills out her ballot during early voting Wednesday, October 17, 2018 at Collegedale City Hall in Collegedale, Tennessee. A steady flow of voters showed up to the precinct throughout the day. NASHVILLE — In a state where voter turnout ranks consistently near the bottom, Tennesseans were on fire Wednesday during the first day of early voting in the 2018 midterm election, with numbers exceeding those in recent similar midterm elections. According to Secretary of State Tre Hargett's office, 120,970 Tennesseans hit early voting sites or cast absentee ballots in the state's 95 counties where they are choosing both a new governor and new senator in open contests for the first time since 2002. First-day voting in the 2014 midterm election was 32,565, while in 2010, another midterm election, the tally was 43,580. By comparison, 143,141 voters cast ballots on the first day of early voting during the 2016 presidential election. Calling voter interest "extremely high" this year, State Election Coordinator Mark Goins said "Tennesseans crushed first day early voting numbers for a midterm. Early voting continues to be popular as a way to vote." A major reason for this year's high interest is the result of Tennessee Democrats' attempt for the first time in years to stage a come back in two top races. The Senate contest, one of the nation's hottest, is a brutal struggle between Republican Marsha Blackburn, a Brentwood congress member, and Democrat Phil Bredesen, a former two-term governor. They're vying for the seat now held by retiring Republican Sen. Bob Corker of Chattanooga. Latest spending by the warring candidates and independent groups has now hit $53 million, a record exceeding the 2002 record, excluding inflation, set by Corker and Democrat Harold Ford Jr. in their contest. Millions of dollars have been poured into television, radio and digital ads, direct mail and canvassing this year to motivate Democratic and Republican voters and persuade swing voters with control of the closely divided Senate possibly at stake and President Donald Trump making two visits here on behalf of Blackburn. Another reason for the higher turnout is the open governor's race between Democrat Karl Dean, a former Nashville mayor, and Republican businessman Bill Lee to succeed term-limited Republican Gov. Bill Haslam. Goins said he believes that early voting, which includes in-person voting and mail-in ballots, will account for 55 to 60 percent of all ballots cast in the Nov. 6 general election. Early voting extends through Nov. 1, excluding Sundays. In Hamilton County, 5,679 people cast ballots on Wednesday, according to the Secretary of State's website. Hamilton County Elections Administrator Kerry Steelman told the Times Free Press earlier this week that almost four times as many people registered to vote in the Nov. 6 election than in 2014 midterms. 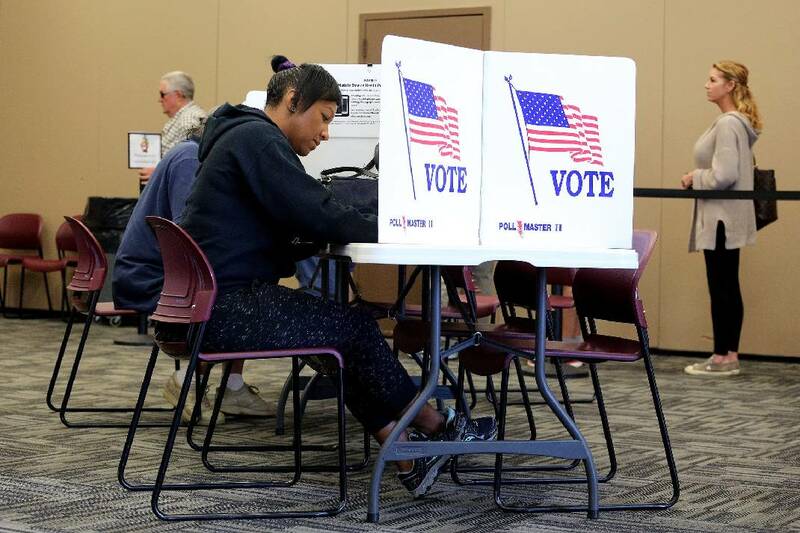 Steelman said the 9,318 new registrations between July 3 and Oct. 9 — deadlines for the Aug. 2 primary and Nov. 6 general elections — let local officials know turnout would be high. That number compares to 2,380 new registrations for the 2014 midterms and 9,418 for the 2016 election. "We knew we were in for a 'presidential-level' election," Steelman said. "We are well-prepared for this election, and it's satisfying when we have this level of turnout." Davidson County ranked No. 1 with 14,616 early ballots cast on Wednesday, while the tally in Knox County was 11,061, according to the state. There were some shifts in totals over the course of Thursday. Goins explained that various counties may have corrected mistakes made when submitting previous figures. Besides the Senate and governor's contests, there are open seats in three of Tennessee's nine congressional districts. All 99 state House seats are up and 17 of the 33 state Senate seats are too. Moreover, any number of towns, cities and counties have candidates up for office or ballot measures. Organizations including the nonpartisan Pew Research Center rate Tennessee election turnout low for a number of reasons. Times Free Press reporter Judy Walton contributed to this report.